My favorites from the drugstore brand. The great thing about sisters is how they always show you their must-have products. I remember that my oldest sister was constantly telling me about makeup remover wipes and after a while, I tried it. Long story short: I fell in love. 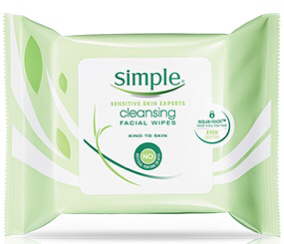 It’s fitting that I should talk about the Simple Cleansing Facial Wipes first. These are gentle, but powerful. I think I may like these more than the Simple Micellar Makeup Remover Wipes. The reason why is I feel as though the Cleansing Wipes are more saturated than the Micellar Wipes, which make me feel like I’m tugging at my skin. Meet the product that you never knew you needed. This is the Simple Foaming Cleanser. It does just as it says, it comes out as a thick foam that is perfect for removing your makeup. Is it just me that feels like I get a better clean when something foams up? I like to use this after I use a makeup remover wipe or some other kind of cleanser. This has completely changed the game for me. This Simple Smoothing Facial Scrub contains small exfoliants that really do give you a deep clean that you can see and feel. I’ve had this for several months and I haven’t put it down since. This product is another favorite of mine. this is the Simple Soothing Facial Toner. I love to apply a generous amount of this to a cotton pad and smoothing this over my skin after cleansing. It’s very soft on the skin. Another staple in my skin routine is the Simple Protecting Light Moisturizer SPF 15. It’s extremely lightweight and really replenishes my skin after cleansing and toning. The best part about it—it contains SPF to protect my skin throughout the day. Overall, I have to say that I truly love the Simple Skincare line. I’ve tried almost the whole line and these are a couple of my favorites. I’d love to know if you have some favorites from the line that you think I should try. Also if you have any questions about any other products I didn’t mention, please let me know. I’d love to give you my experiences with them. *Photos have been pulled from SimpleSkincare.com. I do not own these images.